Monday November 1st 1920 I was busy working at tatting all my spare time. The girls were home all day busy with their own affairs. The weather is still dark. Cora to town in the evening. Tuesday November 2nd 1920 I worked on my tatting and was down to stay with William while Rob took the girls all over to vote. Cora was in bed all afternoon but went out in evening. Hattie did not get home till supper time. I went to bed with a head-ache before supper. Hattie home all the evening. Wednesday November 3rd 1920 I did not get up all day. After a sleepless night. Cora was in bed part of the day too. I had Dr Smith come over early in the evening to see me. A year ago they started to Delavan. 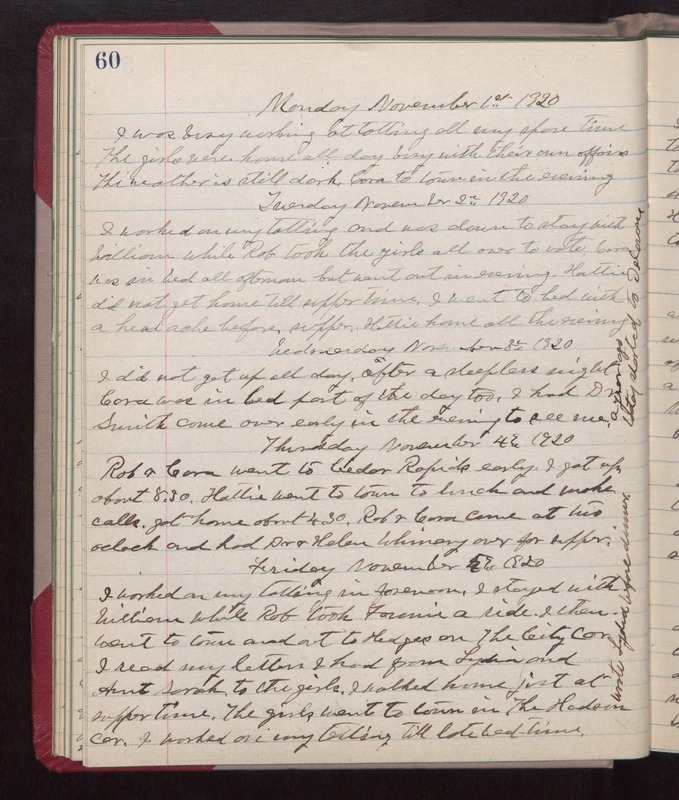 Thursday November 4th 1920 Rob & Cora went to Cedar Rapids early. I got up about 8.30. Hattie went to town to lunch and make calls. Got home about 4.30. Rob & Cora came at two oclock and had Dr & Helen Whinery over for supper. Friday November 5th 1920 I worked on my tatting in forenoon. I stayed with William while Rob took Fannie a ride. I then went to town and out to Hedges on The City Car. I read my letters I had from Lydia and Aunt Sarah to the girls. I walked home just at supper time. The girls went to town in The Hudson car. I worked on my tatting till late bed-time. wrote Lydia before dinner.